Ahmed Mohamed accepted a full scholarship to attend a Qatar school instead of the Massachusetts Institute of Technology (MIT). “Clock Boy” Ahmed chose the reputed home of the Muslim Brotherhood over an institution revered among the world’s finest science and engineering universities. 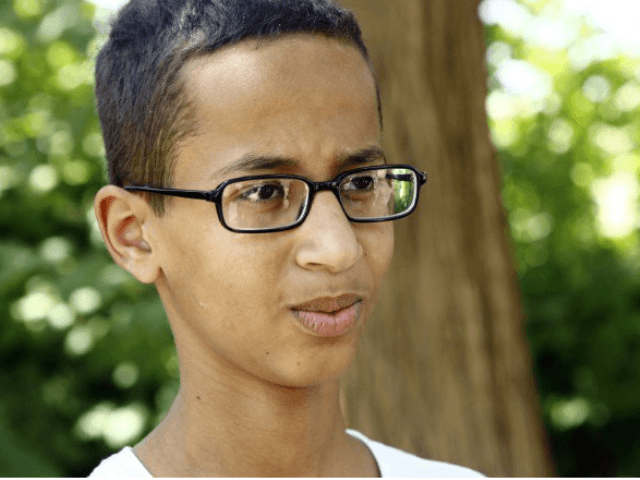 Ahmed is the Texas teen who was arrested and suspended from high school last month after bringing a homemade suitcase clock mistaken for a hoax bomb. His father, Mohamed Elhassen Mohamed, announced late Tuesday, in a statement released by a Dallas PR firm, that that the family accepted a full scholarship offered by the Qatar Foundation for Education, Science and Community Development (QF). Ahmed will complete his high school education and then embark on undergraduate studies through the QF Young Innovators Program. According to the Dallas Morning News, the family intends to jet off to a new life on the other side of the world in mere days but must first return from their latest adventure in Washington, D.C. where Ahmed attended the White House Astronomy Night and met President Obama. Over the past month, Ahmed visited Google headquarters, made an appearance on “Dr. Oz,” went to New York and hung with Mayor Bill de Blasio, jaunted to the U.N. where he rubbed shoulders with Turkey’s Islamist Prime Minister Ahmet Davutoğlu, flew overseas and hugged Sudanese genocidal war crimes theocratic dictator Omar Hassan al-Bashir, and enjoyed a Saudi government funded pilgrimage to Mecca. But, he has yet to pick up his clock from Irving PD. Officers made multiple private and public requests to the family to retrieve their property since the week of Sept. 14. Instead, the teen played the victim with liberal media, as if law enforcement refused to return it.
.@anildash @IStandWithAhmed we would love to have Ahmed visit us at MIT! Eyman said Qatar is “basically like America,” because American universities like Texas A&M and Carnegie Mellon have Qatari-side campuses. Earlier this month, QF gifted the teen and his family with a trip and tour of the five-mile Education City, founded by Al Jazeera creator Sheikh Hamad bin Khalifa Al Thani, who is closely associated with the Muslim Brotherhood and opposes what he calls the “Judaization of Jerusalem” in referencing the Jewish Holy City and Israeli capitol, founded it. In late 2012, the New York Times reported Al Thani pledged $400 million to fund Hamas in the Gaza Strip. Mohamed Elhassen Mohamed said he was hugely impressed by the complex. Last week, the Mohamed, the family patriarch, shared 9/11 truther posts on his Facebook wall. Through out their entire time in the media spotlight, the family played the Islamophobia card, blaming the arrest and suspension on Ahmed being a “Muslim boy.” Earlier today, San Jose, California Democrat Rep. Mike Honda organized a press conference with Ahmed and the family to announce his effort in asking the U.S. Department of Justice to investigate Ahmed’s arrest and treatment by police, ABC News reported. “We are going to move to a place where my kids can study and learn and all of them being accepted by that country,” said the patriarch earlier today to the Dallas news outlet. However, as Breitbart Texas reported, Ahmed’s clock woes happened based on the state and federal safe school and zero tolerance policies. Even the Associated Press agreed, blaming “rigid disciplinary policies” adopted by schools in the 199os.